Our prescription soil treatment service is a customized fertilization tailored to plant species’ nutrient requirements in the landscape. The first step for this service is to take a soil sample within the root zone of a plant to determine what nutrients are deficient to achieve a defined goal. When fertilizing, there is always a goal we are trying to accomplish. These goals can be overcoming an obvious nutrient deficiency, eliminating a nutrient deficiency that is not obvious, increasing growth, and increasing vigor or vitality. The second step is analyzing the soil report that is generated from the soil sample taken for an individual plant. Soil analysis reports are available to clients who would like to understand what is going on with their soil. They are very simple and easy to understand. The report gives information on the presence of essential elements required for plant nutrition, soil pH, and soil organic matter. It shows which elements are deficient in the soil, and how much of an element needs to be applied. The soil analysis report tells us which fertilizer or elements to select to meet our plant-health goals. Please understand that not all companies offer prescription soil treatment fertilization. This is a unique Bartlett service. A specified quantity of fertilizer treatment is applied to the soil to correct nutrient deficiency for individual plants. We are only adding elements required, therefore, excess elements are not added to the environment. Many companies use a one-size-fits-all fertilizer. Using the wrong type of fertilizer may not provide the desired results and could possibly be harmful to the tree and the environment. The third and final step is applying the prescription soil fertilization treatment. Elements of fertilizers are applied within the root area of the plant or under the canopy. Using the soil analysis report, a plant health care specialist will liquid-inject some elements 4 to 8 inches below the surface, while other elements may be applied to the surface. It is very important to evenly distribute fertilizer within the defined treatment area and water in dry fertilizer applied at the surface. Like the Bartlett MoniTor® program, the prescription soil fertilization treatment is customized to individual plants in the landscape. 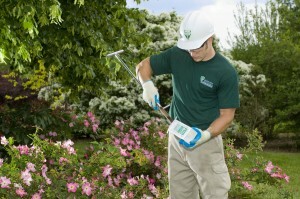 To assess the nutrient requirements of your plants start by taking a soil sample today!